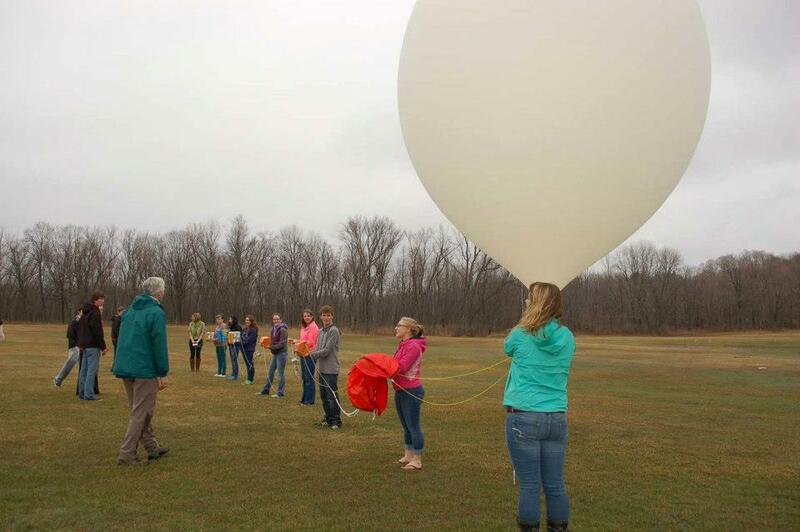 On 24 April 2013, the Maine Space Grant Consortium (MSGC) held its second annual high-altitude balloon launch at the University of Maine at Farmington (UMF). Sponsored by the MSGC, the launch is the capstone event for participating 10th grade students involved in the Astrobiology-Scientific Ballooning (ASB) Project. Westbrook, Winthrop and Mt. Blue High Schools participated in this unique school year program which combines classroom instruction with hands-on learning experiences. The Maine Student High Altitude Platform (MeSHAP) Program is designed to increase students’ interest in STEM careers by enhancing their technical skills and research abilities in the development, launch, recovery and analysis of experimental payloads using high-altitude weather forecasting balloons. Participating high school students work closely with undergraduate university students and professors from the University of Maine and the University of Southern Maine to build their scientific skills and gain insight into how NASA scientists approach research questions, engineering design and mission goals. At approximately 9:00 a.m., Mt. Blue students arrived at UMF’s Prescott Field to begin their preparations for launch. Shortly thereafter, Winthrop and Westbrook students arrived and the field was abuzz with excitement. Dr. Kathryn Foster, President of UMF, ventured down to the field along with many grade school students who arrived in buses from local schools to cheer on the students. At approximately 10:15 a.m., the first balloon was launched. A slight drizzle could not hamper the excitement in the air for the students nor for the crowd that had gathered to witness the launch. To the cheers and delight of all, the countdown began …3,2,1 Liftoff. With that, the students released their balloon and it began to soar above the clouds. Two additional launches commenced shortly thereafter and then the chase was on. Recovery of all three balloons and their payloads was successful and participating students are now analyzing their experiments in their classrooms. As the school year comes to a close, students will report their findings to the MSGC.